The 9-in-1 SafetyPuck warning light is just that, a creatively designed puck-like product that sports 16 LED lights all around the unit that allows for a wide array of illumination patterns. The nine light patterns provide 360 degree light coverage and range from flashing or flickering, to pulsing or swirling, and even a flashlight-like beam. One side of the SafetyPuck is magnetic so it can stick to the side of any vehicle providing light visible for up to a half mile. It is durable enough to function in a temperature range of 130 degree to negative 20 degrees Fahrenheit, and even can be run over by a car and not be damaged. In addition to its use on land, it is waterproof and floats, making it ideal for use in boats and watercrafts. The new Low Lux Night Vision camera is a safety-device that extends your play time or work hours on the water. The black and white picture allows for safe maneuvering of waterways or when docking. Use as a stand alone device or an enhancement to radar. This camera connects to any monitor with a RCA video jack or with a DVR you can record your trip. The camera can be mounted permanently or use the optional vacuum mount for a quick and easy removal. Measuring only 6" in length and 3.5" in diameter, the camera is small enough to be stored after usage to prevent theft. Do you really need a liferaft? Well, if you are out in water over your head, you certainly should consider having some alternative to your boat! Many small cruisers and sailboats do not even carry a dinghy, or if they do, it is stored in such as way as to be useless in most “abandon ship” situations. On striking an object, a boat can fill and sink in just a few minutes. Fire is another very real risk on a small boat. Do you have an “abandon ship” plan? 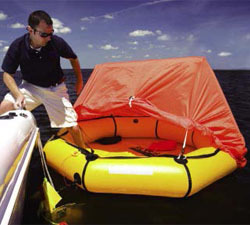 Since the point of this article is to consider whether or not you should invest in a liferaft, I’ll concentrate on coastal and small vessels rafts. We think this is nothing less than incredible. See with significant detail and clarity even in total darkness for just $3,000 US. The FLIR First Mate gives you a thermal imaging camera that is a remarkable tool for nighttime navigation. We think this is huge! When a heater or stove fails, life on a boat, RV or anywhere else can get mighty uncomfortable. The HeatMate™ 5200 Portable Alcohol Heater from Contoure International provides a safe source of warmth that doubles as a stove. Scandia Marine Products has introduced a new dinghy ladder that utilizes their Patent Pending interlocking rung design. This all stainless steel ladder provides any dinghy user a safe and secure method of getting out of the water, in an easy to mount and store package. While the helm provides steadiness to a boat's captain, it's also important for the passengers to keep their balance when the craft changes direction or speed. Accon Marine's Telescoping 800 Series Grab Bar gives individuals something to hold onto when hitting the waves. Boats are vulnerable when they can't be seen at night or in adverse conditions. For safety, navigation lights must be visible at sea and be extremely reliable. Groundbreaking LED technology brings these benefits and more to the state-of-the-art NaviLED PRO navigation lights from Hella marine. To protect critical equipment, assets and the lives of people working and living in large-scale marine environments, boat builders and owners worldwide trust Sea-Fire Marine H Series Engineered Fire Suppression Systems. Meeting extensive national and international approvals, these state-of-the-art systems are designed for high-volume applications.